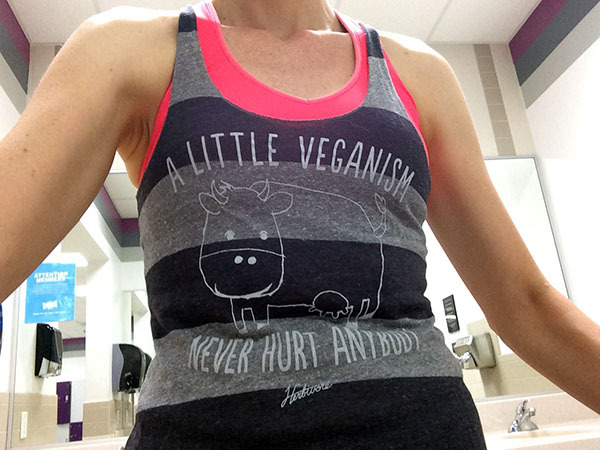 I have been lusting over this tank top from Herbivore Clothing for awhile for a gym tank, so when I saw it at the Vida Vegan Con Bazaar, I grabbed it! And I love wearing it to the gym because it’s cute and sends a positive vegan message. It’s also a great length to wear with tight compression shorts and capris being a little longer that a typical tee. Truthfully I’m not a meal/protein bar person except when traveling or I need an emergency meal, they never seem that satisfying for the calorie count and I’d rather eat a huge salad, snack on nuts, or eat fresh fruit. 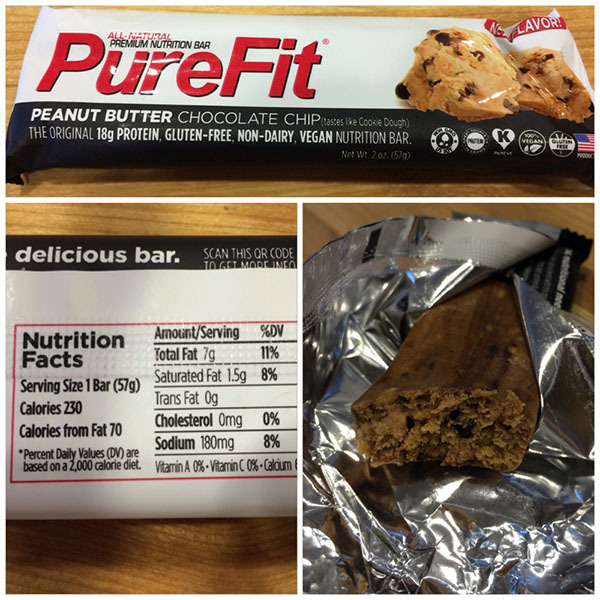 But I made an exception to try a PureFit bar for a hurried work lunch this week with a couple pieces of fruit since I received a generous sampler pack in the Vida Vegan Con swag bag. It’s a big bar for only 230 calories compared to a Lara Bar or others I’ve tried and 18 grams of protein is a hearty meal replacement being a pretty big chunk of one’s daily protein requirement. The ingredient list is simple, not full of empty calories or scary chemical preservatives. The Peanut Butter Chocolate Chip flavor was good, like a semi-sweet cookie with a slightly savory peanut butter/dark chocolate blend and a fudge-like texture. It held me over nicely until dinner, much better than I expected. So I will put these on my Amazon shopping list for traveling meals. 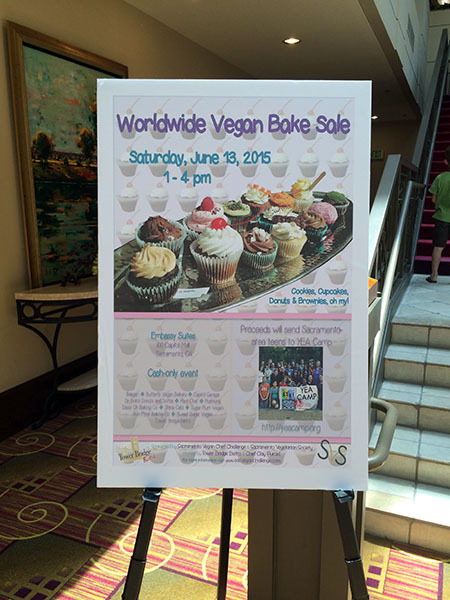 Yesterday there was a Worldwide Vegan Bake Sale in Sacramento to support a good cause – the YEA Camp, so I had to go! 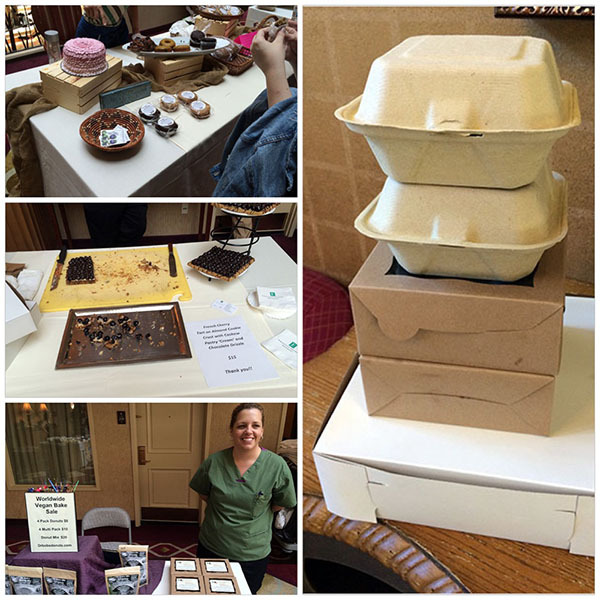 Especially when some of my favorite local businesses were selling amazing treats. I might have gone a little crazy loading up – I carried out five boxes! 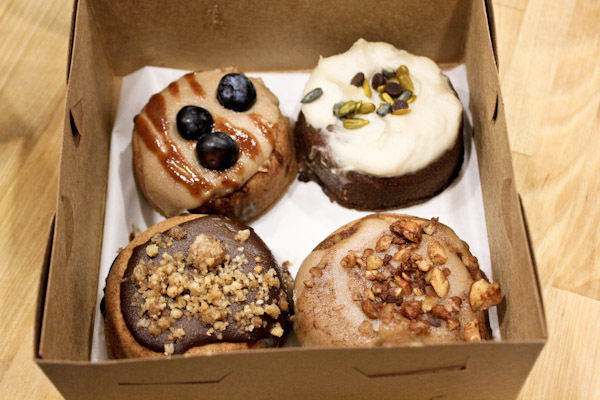 But our freezer is stocked with healthier treats now! 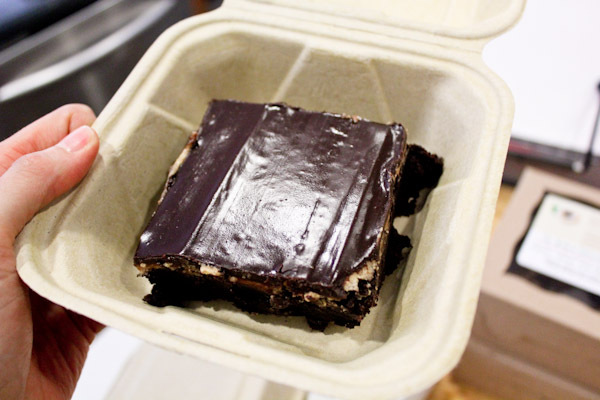 I grabbed a couple of things for hubby and I to share right away, like this amazing Chocolate Peanut Butter brownie from Garden to Grill. It was so good with a crunchy layer of peanut butter under the chocolate frosting. But maybe a little too sweet or sweeter than I’m used to. 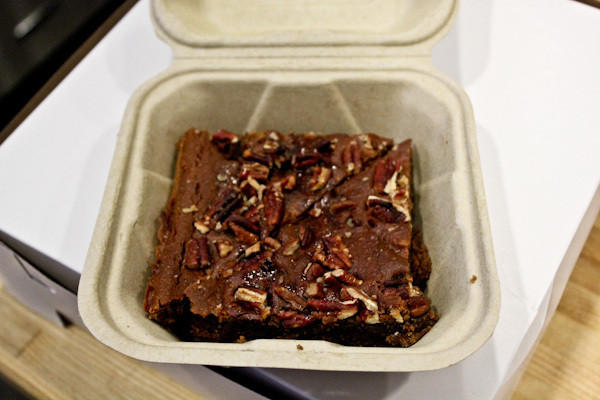 We also shared wonderful maple pecan brownies from Baagan which were fabulous! Not too sweet, just the right amount of maple flavor and rich texture with crunchy pecans – lots of flavor depth to savor. 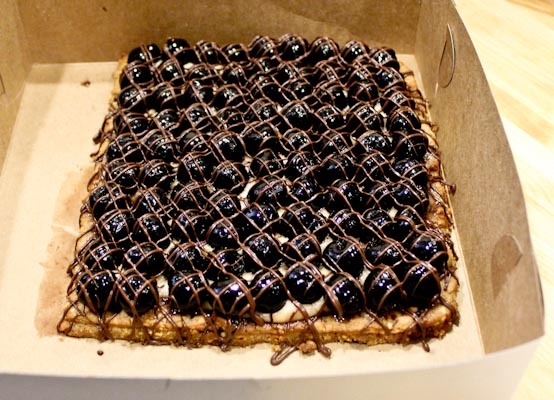 I also grabbed a huge cherry tart with an almond crust, a layer of cashew cream, and drizzle of vegan chocolate from Chef Clay Purcell of the Tower Bridge Bistro. I haven’t cut into this beauty let, but the sample I had onsite was amazing with the sweetness blended with tart, ripe cherries. I think I will freeze it in little sections for easy treats. 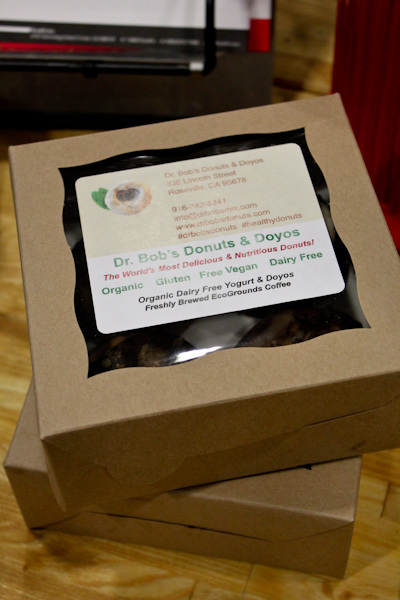 I also grabbed two boxes of healthier vegan donuts from Dr. Bob’s Donuts & DoYo’s because they also store nicely in the freezer and are made with my type of ingredients – fresh nuts, seeds, fruits, veggies, chia seeds, hemp protein, pea protein, etc. 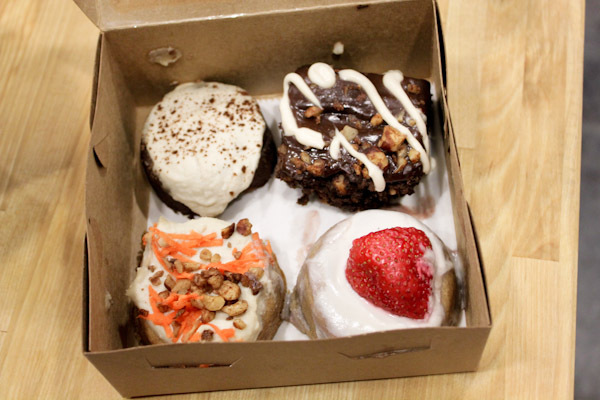 I’m really excited about the carrot cake one, yum! Miko pouted at me for not giving him any samples, no chocolate for sweet little chihuahuas! 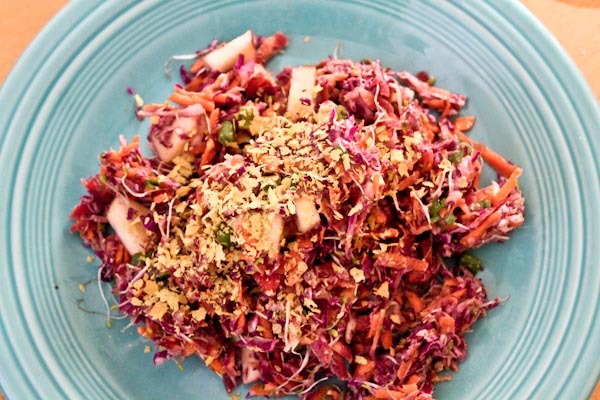 But he got plenty of carrot treats while I was making this healthy slaw for dinner, I figured a veggie loaded salad was in order after that peanut butter brownie! 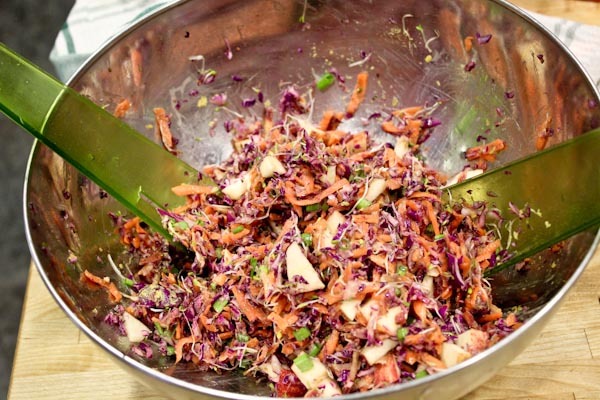 I grated fresh carrots, red cabbage, and threw in alfalfa sprouts, chopped green onion, and chopped apple with Creamy Balsamic Dressing. And it was a hearty and filling meal, refreshing and cool while it was 100 degrees outside! It’s been a great week in the vegan world, hasn’t it? Big changes in companies, celebrities announcing vegan diets, and great health news! So this is going to be a great list! I’ll start with the serious stuff – I have mixed feelings about this. Our governor, Jerry Brown, has been very blunt about talking about the reality of global warming and the environmental impacts especially with the insanely scary drought and warming temps here in California. Sh*t is getting real with weather changes all over the world and it’s scary to think it’s only getting worse. Here Governor Brown discusses how much of California’s water and resources goes to growing alfalfa for livestock and he thinks we should all be eating veggie burgers! Beyonce’s announcement that she’s vegan may be controversial, but I am all for it! She’s gorgeous, talented, and I hope she fully embraces the plant-based lifestyle with glamour and class. And Miley Cyrus announced she’s on a vegan diet too! Yes! Retired NBA star John Salley is very clear about why he’s vegan and I want to find his vegan wine! The Today Show did a great story on treating patients with a plant-based diet. Forks Over Knives reminds us that following a plant based diet is the best thing we can do for the environment and world hunger. 7-Eleven will only be serving Hampton Creek’s Just Mayo, a healthier, plant-based mayo that’s better for the environment which is huge. Ben & Jerry’s has announced that they’re working on vegan options! 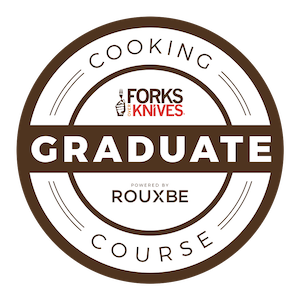 And more plant-based options are showing up at fine dining restaurants. Even Tesla is getting heat to be vegan friendly, lose the leather! For fun, LifeHacker has 4 vegetables you can grow in your kitchen. Finally, I have to agree with the benefits a plant-based diet has on skin. Thanks, I got my dessert fix for the next few months, whew! You have a great week too! Agreed on protein bars, this one could be a great traveling breakfast. I love John Salley. He handled the interviewer perfectly. No worries, you’re free to express your opinion here. :-) All the vegan news on Beyonce has been a little exhausting and if she truly is starting a vegan business while not thriving on the lifestyle, that seems like a pretty bad business choice. But I am optimistic that she will embrace the lifestyle more and hopefully shine more positive light on it. I think it looks terrible when vegans publicly criticize and attack a celebrity’s effort to embrace a vegan lifestyle or even just promote cutting out more animal products. The transition can be a long journey that needs encouragement. I respect Miley for taking a year to transition to the lifestyle before announcing it probably to make sure she’s ready to be a role model for it too. Agreed, it’s a journey transitioning to a plant-based life style and there seems to be so much debate on how to do it. I’m glad Beyonce is taking it on and I hope she continues to embrace it more and thrive. Hi Christine! I just found your website. Miko is so cute. 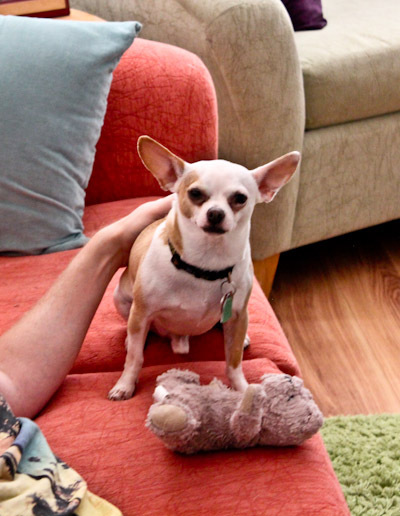 :) I love when bloggers post pics of their animals. I hope Beyonce will embrace the vegan lifestyle more once she gets into things. Maybe she’s still learning? Either way, she’s a huge name in Hollywood and hopefully that will get others interested in learning more about the benefits of going vegan. Oh and I almost bought that same shirt at the NYC Vegfest! I got one with a little bunny on it that says Ferocious Vegan instead but I wish I got both! Thanks on Miko and welcome, looking forward to checking out your site! Agreed on Beyonce, I happy she’s adopting a plant based lifestyle and it’s a process to fully adopt it. I wish I bought more tanks too, there were at least two more I was debating on, I could have spent hundreds more at the bazaar easily!